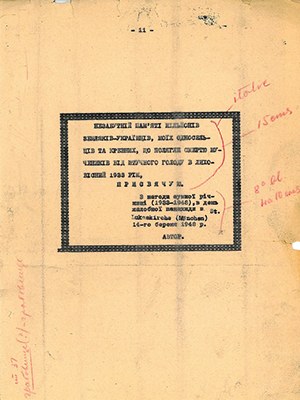 HREC is supporting the publication of 16 Holodomor memoirs from the archive of the Ukrainian Cultural and Educational Centre (Oseredok) in Winnipeg. These were gathered as part a competition held in the late 1940s for memoirs about the Second World War. The accounts are of particular value as they were written relatively soon after the Holodomor and reflect the experiences of Ukrainian intellectuals, teachers and other professionals. HREC anticipates publication in early 2015. Below are some examples of some of the material found in the Oseredok collection regarding the memoir competition as well as a full translation of the Hanna Kashynska submission and excerpts from the K. Petrus account (the cover of which is illustrated). I, Hanna Kashynska, was born on 23 December 1912 року in the village of Hlodosi in the Kherson region; I am a Ukrainian. My father, a peasant, was dekulakized in early 1929 and deported to the Far North. Dekulakization took place in a brutal fashion: at night, when the temperature was -30°; people were thrown out into the cold, not allowed to take anything warm with them, even for the children. Ejected from their houses, people were herded at night to the village soviet, where they waited out in the open air until morning. Among them were many people with small children, the elderly, and the sick, all standing in the clothes that they had been wearing, some having managed to grab something with them. In the morning the dekulakized people were herded in large columns to the railway station twenty-five kilometers from the village. The elderly, the sick, and children died along the way, and their relatives, who wanted to help the dying with their last ounce of effort, were shot on the spot. Near the station the exhausted, naked, and starving waited once again in the open air for transport. My older brothers and I escaped two hours before the arrival of GPU agents because we were warned by the secretary of the village soviet, who, in the face of this threat, tried to warn whoever could to save themselves. Unfortunately, in keeping with the GPU’s plan, very many families were subject to dekulakization (in my raion alone sixty families were targeted, and there were 12 raions); it was thus impossible to warn everyone. For warning people, the secretary was liquidated, and dekulakization took place every night according to plan. and its scale intensified. For many years my brothers roamed Central Asia and the Ural region, but I remained in the Dnipropetrovsk region, where I lived thanks to purchased documents and worked as a teacher in the village of Obukhivka from 1929 to 1932. In those years I was a witness and co-participant in our people’s great sufferings during the introduction of collectivization in Ukraine. I still remember the surnames of many of those who were tortured. From 1932 to 1937 I studied medicine at the Dnipropetrovsk Medical Institute. I witnessed the mass deaths of entire villages from the artificially induced famine in Ukraine because of the Ukrainians’ defiance of the Soviet system and collectivization. Families that I knew well from Obukhivka, where I had taught school, starved to death, every last person, in the space of a few weeks. Keeping in touch with Obukhivka, each day I lost more and more acquaintances, whose entire families were dying. In the spring of 1933 I wanted to visit a family from Obukhivka, whose children were the best pupils in my class. After disembarking from the steamboat and going ashore, I noticed that there was not a single child near the pier on the Dnipro River (in the past, very many children of different ages would gather every time a steamship arrived at the Obukhivka quay). As well, there was no sign of any kind of labor either in the fields or gardens. The only people walking about were those who worked in the factories in Dnipropetrovsk and received rations there. Arriving at the home of the H. family, who had six children, I did not see anyone either in the yard or at the windows. I entered the house and heard groaning. I draw near [and see] two children in a bed; one is trying to speak. I recognize the older [girl]; I ask how she’s doing. Her answer was: “I’m afraid because rats are crawling over me, and it’s been a few days since Tania died, and the rats ate her eyes, and now they’re creeping up to me, and mama on the stove with the smaller children fell silent the day before yesterday, and on Sunday some people took Petro and my father away because they died a long, long time ago.” I left the house and went to the neighbouring house, where the Shch. family lived. It was empty, the paths were overgrown. A woman walks past the yard and says that everyone on this street had already died in the winter because they had not joined the collective farm and were not allowed [to work] in the factory. I entered the school, there are no children to be seen, no one is running around, the teachers have all left; the only ones left are the principal and a few students whose parents worked at a factory in the city. I learn that only a few children remain out of my former class of forty-five pupils; the rest have already died. No one is helping, no one from the government is interested, and the population that is still holding on is afraid to help because, for rendering assistance to the unfortunate, they pay without fail with their own lives. In this village the only ones who survived were those who worked at the factory. Villages that were located farther away from the city had died out, one and all. I return to Dnipropetrovsk and run into a colleague who worked in the village of Vodiane, near Nykopil. She says: “I’m not working, there are no children, no people…only 40 remain out of a population of 5,000, and several hundred people who abandoned the village and moved to the city. Four thousand are left from my village of Hlodosy, which had a population of 25,000; and 21,000 people were either deported or died, with the exception of a handful of people who were lucky enough to escape, but who have to live under foreign passports, under false names, and even change their nationality because there was a very bad attitude toward Ukrainians; they were not trusted and were imprisoned at the very first opportunity. I remember many surnames of the people who were murdered, deported, and starved to death. The authenticity of the signature of Ms. Anna Kashynska, written in her own hand in my presence, is hereby certified. The special NKVD collegium met behind closed doors. Seated at a red table were Peterson, the head; to his right and left were two members of the collegium, one in a military uniform and the other in civilian clothing. 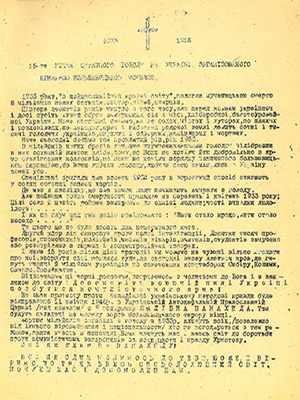 The defendant, an elderly engineer, sixty years old, was accused of collecting and recording in a copybook all kinds of anti-Soviet jokes, expressions, ditties, and parodies of various revolutionary hymns and songs when he was a foreman during the construction of a bridge in Sochi, and then reading them within a close circle of his assistants, and this entailed the risk of punishment foreseen by Article 58, Point 10 of the Criminal Code: from six months [imprisonment] to capital punishment. “Defendant Alokhin, this is your notebook with stories and jokes?” Peterson asked severely, looking straight at him. “Yes, it’s mine,” the old man replied calmly with a barely visible smile on his face. “I already said this during the investigation.”. Nor show us any fatback! Arise, ye who are oppressed by the commune. Let’s march on Kyiv to kill the enemies. Who’s the last one [in line]? I’m right behind you! “A drunk citizen is walking on the street hiccupping and burping loudly. ‘What’s wrong with him?’ a young passerby asks an old man. And the silence of the grave. Peterson (coughs, wrinkling his forehead, interrupts Alokhin and asks him harshly): “Citizen Alokhin, do you acknowledge that you are guilty of the accusation against you? All the evidence is at hand! The old man was brought back to cell no. 33, from where he had been taken to court, only at lunchtime. Alokhin chewed very slowly and the entire time he smiled unnaturally, recounting his conversations with the judges. “It turned out that they were not trying you but you them,” concluded someone in the cell who was listening to his account. “I don’t care,” replied engineer Alokhin, and he began arranging his belongings. This happened in Ukraine, in the Kuban, in Terek oblast, among the Kalmyks, in Turkestan, and other oblasts of the Soviet land. It happened at a time when the Soviet Union was throwing onto the world market, at dumping prices, billions of poods of grain, fish, meat, dairy products, vegetables, naphtha, fuel, matches, forestry products, and manufactured goods. This was when wonderful grain crops sprang up in our native fields, but all-out collectivization either let them rot in the fields or sucked them out from the peasants in order to supply countries abroad. And Soviet grain growers began to starve. Tens of millions of peasants, who earlier had fed both themselves and millions of other people, were left without grain. The famine began in Ukraine. When the last kilograms of grain, garden produce, and root vegetables were forcibly taken from the peasants, they began to eat oak bark, acorns, and the roots of all sorts of plants. All cats, dogs, and small domestic animals were consumed. The more agile part of the population rushed to various corners of the country in search of bread. Trains packed to the rafters with starving people headed for the big cities and industrial centers, where the food balance was maintained by the policy of “facing toward the city.” The grain-producing oblasts of the country, which earlier had fed all the large cities, were now seeking salvation there from death by starvation. Despite the GPU barrier detachments, however, many people succeeded in reaching the capital and labour centers, where they gave away their last items of clothing, footwear, and valuables for kilograms of bread. On the way back they encountered GPU men, who confiscated this last scrap of bread. In despair, people threw themselves under trains, hanged themselves, drowned themselves, or died slowly at remote substations, with no energy left to make it home. The black wings of death hovered over every large village, and there was not a single corner in Ukraine where the terrible famine was not raging. People began feeding on carrion and human corpses. 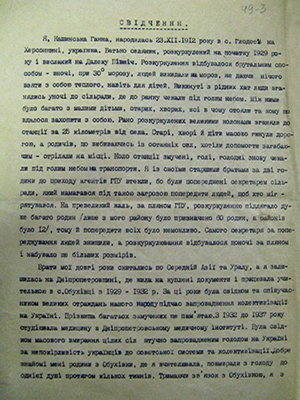 Acts of cannibalism stemmed from the consumption of corpses/Від пожирання трупів перейшли людожерства./ In many locales, mothers who had gone insane from the horror ate their own or strangers’ children. The GPU uncovered large gangs of cannibals, who caught their victoms and even sold meat products made from human flesh. Male cannibals were shot, while female cannibals were sent to the Solovetsky Islands. The spring months, March, April, May, before the grass came up and the first root plants, vegetables, and berries emerged, were especially difficult. Scattered along roads, paths, and canals were the remains of unfortunate people gnawed by people or animals in the field… Some large villages lost 50–70 percent of their population. How many people starved to death in Ukraine? Moscow’s statistics are silent about this. It even denies that a famine ever took place. Is this shameful or disgraceful? No, neither one nor the other. It is necessary to conceal [it] from the West so as not to defame “Stalin’s Five Year Plans.” Does it matter how many robots died—five or ten million? Did they remain in power? Yes, they did. Did they build military giants for the production of tanks, cannon, gases, planes? Yes, they did. Did they come even closer to [achieving] world revolution, when these tanks would come in handy as a decisive force? They came close, and they’re “always prepared!” And they don’t give a damn how many people starved to death there. And they didn’t. And they did worse. Still living skeletons throng next to Torgsins in order to trade a last silver or gold cross for a handful of groats… Unfortunates writhe in the agony of starvation before death… Corpses lie about and stink… And over this entire horror the radio broadcasts concerts, foxtrots, songs, and speeches about the achievement and overfulfilment of the plan… Death by starvation to the accompaniment of music along with figures on the achievements of the first Five-Year Plan “in four years”!!! What is this, socialists and proletarians of all countries? What is this called in the light of even a robber’s morals? In our country this is called Satanism, and in yours? “Soviet democracy,” it would appear. But this is a subject for another time. Now I will continue about the famine, about the same famine that took place in other oblasts the following year, 1933. During the tsarist period the Kuban region could feed itself at least for three–four years with one year’s harvest. This was the goldmine of the Northern Caucasus. But in 1933 the Bolsheviks turned it into a cemetery. They sucked out everything. Even wild pears that people had prepared for the winter were confiscated. For failing to complete the grain deliveries, which exceeded their reserves of grain by several times, individual homesteads and entire stanytsias [Cossack settlements—Trans. ], like, for example, Poltavska, Ust-Medvedivska, and Uriupska, were deported beyond the Urals, where nearly all of them perished. Those who were not deported began scattering every which way. But the omnipresent GPU feelers caught up with them everywhere and turned them back to…the closest prison or deported them to Siberia again. Prisons and detention buidings were filled to overflowing. Prisoners were issued between 50 and 100 grams of bread a day. Only a lucky handful of those who ended up in prison during this period survived. In the Krasnodar prison, for example, between 20 and 50 people died every day. This mortality rate existed in other prisons in this territory. The people who who were left in stanytsias and hamlets, like in Ukraine, began to eat everything that was edible: dogs, cats, rats, horses, all kinds of carrion, tree bark, dead animals, human corpses; the inhabitants of stanytsias, driven insane, began to eat everything. In mid-winter sinister rumours about cannibalism began to circulate. How terrible these rumours were! One could scarcely believe them. In the stanytsia of Abinska a female trader slaughtered the little girl of her [female] neighbour and prepared jellied meat out of her and sold it to passengers at the railway station…She was caught red-handed and arrested. People said that the GPU may have shot her… Or perhaps she was transported to the Solovetsky Islands. In the stanytsia of Slavianska an acquaintance of mine, a raion doctor, took part in a GPU commission to examine 18–20 arrested individuals who, in organized fashion, hunted down people and ate them. During interrogations they roared with laughter and behaved like madmen. They were shot. In the stanytsia of Akhtyrska, my good friend Alokhina, who was a member of the Khlyst sect, after getting divorced (the Khlysts do not consider this a sin), took in some people from the Kuban into her house, which consisted of a kitchen and one room. After a few days the lodgers, a man and a woman, slaughtered their landlady, stripped the flesh from her bones, and buried the skeleton and entrails in the vestibule, which they covered with all sorts of trash and strips of wood. The flesh was placed in a bucket and prepared for cooking. Early in the morning a [female] neighbour entered the house and began asking where Alokhina was. The lodgers, who had quickly covered the bucket with a cloth, replied in a confused way that the woman had gone to visit her daughter in the Kuban. The neighbour knew perfectly well that whenever Alokhina went to visit anyone, she always put on her good clothes and new slippers. But here were her clothes hanging against the wall, and the slippers were under the bed, which seemed very suspicious to her. But when she saw white meat in a bucket that had been covered carelessly by the frightened lodgers, she was seized with a horror she had never felt before. She went outside solemnly and ran to Alokhina’s ex-husband so that he could take necessary measures. She told him about her suspicions and together they went to the police. The cannibals, sensing trouble, had run away in time, grabbing some of the landlady’s belongings. The policeman who arrived on the scene discovered only the skeleton buried in the vestibule, along with the entrails of the unfortunate woman. The cannibals had taken the flesh with them. In Krasnodar a prostitute invited a party member who was travelling on business to her house. During the night he was awakened by a strange wheezing coming from behind the plywood partition. The prostitute was no longer lying next to him, and there was some sort of commotion going on in the next room. Carefully and on tiptoe, he approached the half-open door and saw some unfamiliar people cutting up a human corpse. The dumbstruck party member jumped out of the window onto the street, raised a clamour, and began firing his revolver. Night watchmen and the police, who rushed to investigate the noise, surrounded the building of horror, but there was now no one in the house except for the unfortunate person who had been killed. In the stanytsia of Troitska a brother was fixing on eating his sister, who was visiting from Rostov, but, horror-stricken, she escaped from his hands and was saved at the stanytsia soviet. The cannibal disappeared. People said later that several skeletons were found underneath the floor of his house. In Novorosiisk, children’s fingers were discovered in a purchased Delfin sausage. Similar things were said about baked pies in Krasnodar. The morning after the death of a passerby who had died on the street of exhaustion caused by starvation, his corpse had been stripped of clothing and eaten by his starving traveling companions, who died the following day. Their bodies were also eaten. Cannibalism lasted until May, when grass, edible roots, fish, and all kinds of greenery appeared. Already by 7 August 1932, a law punishing anyone who infringed on state property with a ten-year sentence was passed. A starving woman dug up ten kilograms of potatoes out of a collective farm’s abandoned vegetable garden. She was tried and sentenced to ten years. A starving teenager who worked in Novorosiisk salting fish was given a ten-year sentence for stealing a pail of anchovies (small fish). In the stanytsia of Kushchivska members of a collective farm who were sowing spring wheat stuffed themselves with the seed grain, which had been treated [with chemicals], and dozens of them died right in the field, behind the sowing machines. The law of 7 August could no longer touch them. After a community of evangelical Christians consisting of eighty members gave everything to the [grain] collectors, they refused to join the collective farm, and in the last stages of exhaustion from starvation they forced themselves to go to the cemetery, where, with a prayer on their lips they began to die quietly. By the third day the last martyrs were dying, their hands clutching Bibles. A sanitary brigade composed of Komsomol members from Stavropol dragged them into a mass grave only two weeks later. Something similar took place on the Terek River, in Kalmyk oblast, in Central Asia. According to eyewitnesses, cannibalism in these oblasts cannibalism escalated to such threatening dimensions that even the GPU became alarmed. Several thousand cannibals were arrested, most males—Muslims, nearly all of whom were shot in the GPU cellars. How many unfortunate peasants and other citizens of the USSR died as a result of the artificial Stalinist famine? No one knows the exact figure, not even the GPU and the Statistical Directorate. In any case, this figure is no less than 15 million. Later, during the investigation, when I gave the figure of 20 million victims of starvation, the investigator protested and began threatening me with all sorts of problems. I agreed to reduce them to 10–12 million; the investigator fell silent and wrote that figure in my case file. Then I thought: if the GPU is agreeing to 10–12 million, then how many unfortunate people really died? And how many cannibals were captured and arrested, or how many cases of cannibalism were there? This is the GPU’s secret. 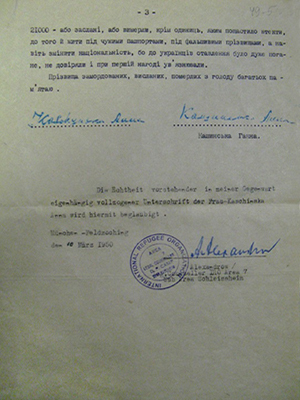 Already in 1939, when the prisoners from “Yezhov’s batch” were moved from the Solovetsky Islands to the polar region, I found out from them that all the prisoners were moved from the Solovetsky Islands, with the exception of 340 female cannibals, who were kept behind as workers at the local GPU agricultural farm. “And what kind of animals are they, these female cannibals?” a prisoner asked the narrators. … Yes, yes, this happened in 1932–33…in a country that calls itself the most democratic country in the world. But what does this phrase mean when this very Chekist was directing a campaign to pump grain out of the stanytsias and deport the dekulakized to Siberia and Central Asia? Moreover, he could not have been unaware of the secret resolution that was passed at the well-known meeting of leading party activists of the North Caucasus krai (1933). 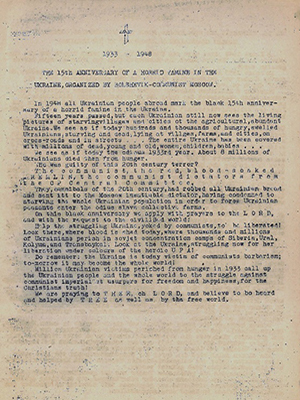 During this meeting Kaganovich, the representative of the “party and the government,” declared with authority that if, in order to carry out the tasks of the party and the government, it became necessary to step over the corpses of the kulaks, who are mounting resistance, then local party workers should do this. The Ukrainian Cultural and Educational Centre (Oseredok) (Winnipeg). The “Memoir Competition” Collection, file 8, fols. 65–68, 246–53. Original. Typescript. 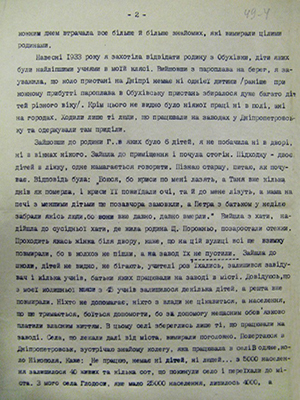 Testimony of Hanna Kashynska about the Famine of 1932–1933 in the Dnipropetrovsk region. March 10, 1950. Original, typed. 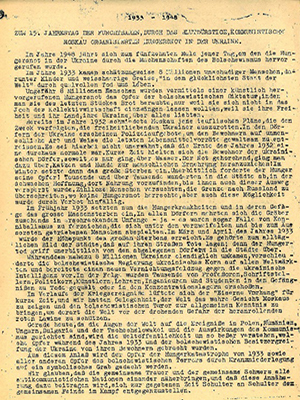 Flyers in Ukrainian, English, and German, distributed by Ukrainian participants at an April 11, 1948 demonstration in Hanover, Germany, on the occasion of the fifteenth anniversary of the Famine of 1932–1933 in Ukraine. Not later than April 11, 1948. Original, typed. 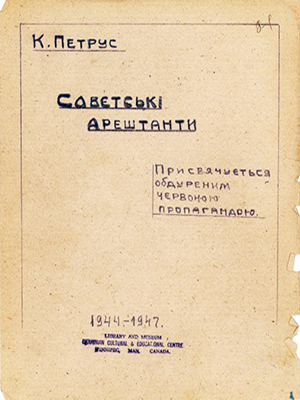 Cover of K. Petrus’s “Soviet prisoners.” 1944–1947. Original, typed. 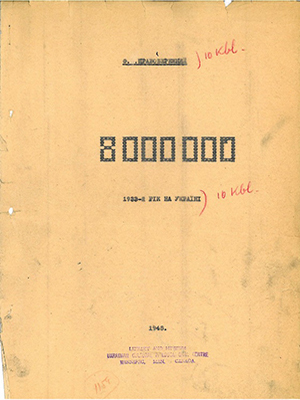 Cover and dedication for the book by Fedir Pravoberezhny (Pigido) “8000000. The Year 1933 in Ukraine.” 1948. Original, typed. Badge worn by participants at a demonstration in Hanover, Germany, on the occasion of the 15th anniversary of the Famine of 1932–1933 in Ukraine. Not later than April 11, 1948. Original, colour image. 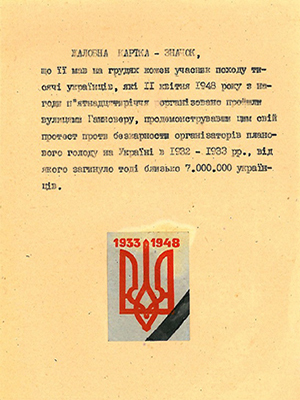 The symbol is glued to the page; it appears that the typed description accompanying the badge was made by D. Solovei.